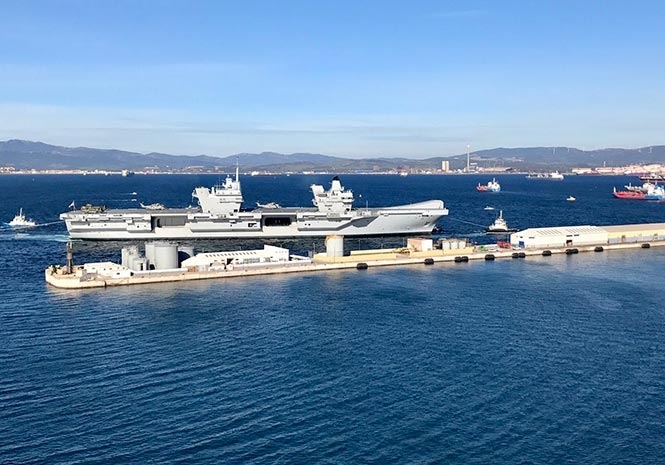 THE Royal Navy’s most recent and expensive vessel HMS Queen Elizabeth has made Gibraltar its first port of call outside of the UK. Still undergoing sea trials and on a six week deployment for operational training, the aircraft carrier sailed into Gibraltar today (Friday). The Chief Minister, the Hon Fabian Picardo QC, along with His Excellency the Governor, the Deputy Chief Minister and other local dignitaries, have been invited on board for lunch by the Captain. During the lunch, Mr Picardo will welcome the ship and her crew to Gibraltar. Prior to the lunch Mr Picardo said “I and every Gibraltarian will be proud that Gibraltar is able to host HMS Queen Elizabeth at Gibraltar Port on her first stop outside of the United Kingdom. Gibraltar continues to offer an important strategic advantage to the Ministry of Defence, and Her Majesty’s Government of Gibraltar is delighted to offer whatever logistical assistance we are able to.